I am the tayto park magician! 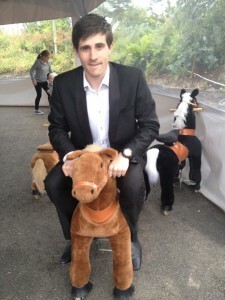 For the past 2 and a half years I’ve been performing my family magic shows in Tayto park as the resident magician. For more info on the show and details about Tayto park click here. Every Summer, which is when the park is busiest, I perform 2 different shows, magic show “A” on certain days and show “B” on other days. The shows are changed to brand new ones each summer. I designed the show so that all ages will enjoy it. Having an audience that ranges in age from toddlers to grandparents means the entertainment has to suit them both, and all ages between too. It really is a family magic show and not a kiddies magic show. The park has attractions that cater for all ages. Tayto park is one of the few places in Ireland with a consistently running magic show open to the public. If you’re ever in the park come by and visit us. Admission to the show is free once you’ve paid into the park. It’s a bonus! The shows run every hour on the hour starting at 12pm between 3 and 5 times per day. The magic shows last 30 mins. 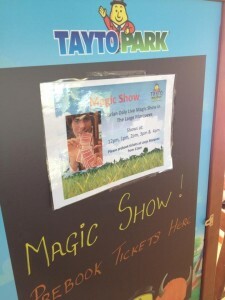 Click here for more info on Tayto Park and its magic shows. The shows aren’t on every day the park is open so ring the park before you go and double check that all the attractions are open. Some are also weather permitting. For example the zip-line can be closed if it’s too windy out. Remember to bring clothes that suit all types of weather. Because, there’s no such thing as bad weather there’s only the wrong clothes.